When Star Trek: The Next Generation was being developed, the Ferengi were created to be the main recurring antagonists. They were ominously name-dropped in the series premiere and made their first on-screen appearance going up against the Enterprise crew in the fourth episode, “The Last Outpost.” The fans, writers and producers generally agreed that this introduction was a failure, and the Ferengi didn’t end up meeting the goals set by series creator Gene Roddenberry. What we were told about the Ferengi and what we ended up with were like night and day. The Ferengi were going to be the new Klingons. They were never meant to be a comical race; they were meant to be ferocious and menacing. And unfortunately, they hired me to play one of the lead Ferengi, and I failed miserably. My final performance was not at all what [Star Trek: The Next Generation creator] Gene Roddenberry wanted. By that point, he was rather sick, and he was not on set. But I met him briefly–maybe no more than 30 seconds–when he looked at my makeup and looked at my costume. “The Last Outpost” was a disaster. And no one one bears the brunt of that mistake more than I do. I didn’t put it behind me for years; it was like sword of Damocles hanging over my head. All of my work on Deep Space Nine, for the first four seasons, was me trying to eradicate that original performance from everyone’s mind. It was my personal agenda to rectify the mistake I made–to take a one-dimensional character and make him a three-dimensional character. I was not a fan [of the Ferengi] and I thought it was a mistake. The moment it clicked for for me was when I did the pass on “Babel,” which was the first real episode I wrote on DS9. We started out with Rom being the hard-core Ferengi who didn’t want his son to go to “HU-mon School” and frankly I thought that did not work for me. I didn’t like the Ferengi being the nasty hard-line guy. What I had was a scene with Quark with O’Brien or Odo and Quark said, “My brother couldn’t fix a straw that was bent,” and that line just started me thinking, what if this was a show about brothers, about these two brothers. You have the successful brother and the loser brother. And I started to think of the Ferengi in human terms, 20th century human terms. And that nailed them for me. And that became my push. Not that they were so much comedic – although they were comedic – but more importantly they were 20th century human beings and we could write their relationship as such. With this more personal and lighter tone, Behr and the other writers were able to flesh out the Ferengi over seven season of DS9, giving us great character moments and lots of world building, such as the Rules of Acquisition, the Grand Nagus and the Great Material Continuum. Roddenberry didn’t want the “big bad” of the series to be Klingons (therefore the alliance) and wanted the new villains to have a reason to be evil. So the reason the Ferengi were bad was because they were greedy (very profound, yes). When the episode came, director Richard Colla took one look at them and thought they looked like monkeys, so he made them act like ones. The rest, unfortunately, is history. I’m glad that DS9 was able to redeem them and make them a very interesting race. I have a copy of the Rules of Acquisitions on my phone and do refer to them from time to time :) My favorite: Rule 211: Treat employees like the rungs on the ladder of success. Don’t be afraid to step on them to get to the top. “Consevatives in the last outpost”? What does that even mean? I think the season 1 TNG episode The Battle (the one about the Stargazer) is a good indication of where Roddenberry wanted to take the Ferengi. Scheming, conniving, vengeful, untrustworthy, etc. How on Earth was “TNG a mockery of canon”? There was very little “canon” when the show was created. And they didn’t spend the next six years violating the prime directive. Opportunity plus instinct equals profit. Obviously he didn’t have the lobes for it! Shimmerman is one of the best actors every to grace a Star Trek set. He is a class act, with an amazing talent and intellect, and a huge heart. He fought not only conceptual battles for his characters, but also personal battles for himself and his fellow actors on set. I’m not surprised he’s so hard on himself, as he sets the bar on dedication both for his craft, but also for the rest of his colleagues. I think he did a good job in Ds9. I am not sure he should care too much for that TNG s1 episode. It was an early episode and a lot of the material was a but silly. And “Last Outpost” is far from the worst first season episode anyway. Compared to “Code of Honor”, “Justice”, “Haven”, or “Lonely Among Us” it is Hugo material! Honestly I hated the Ferengi when they first showed up and REALLY hated the idea there would be one full time on DS9. I didn’t see the point, it was so weird to even have one on the show. And then I saw the show. My mind was changed completely about them. And what’s funny is I didn’t realize until fourth season of DS9 that it was Shimmerman who played the original one lol. Never even occurred to me because they were so different. I’m still curious to learn after such a bad disaster of introducing the entire race in TNG who came up with the idea of giving him a full time role of playing one again? Everything in your mind would tell you he’s the last guy you should hire just by association alone, but I’m SO glad they took a chance on him again. Shimerman is a good actor and I can’t that show without Quark. It would lose something entirely and why DS9 is just so different (and better IMO) than other Trek show before and since. 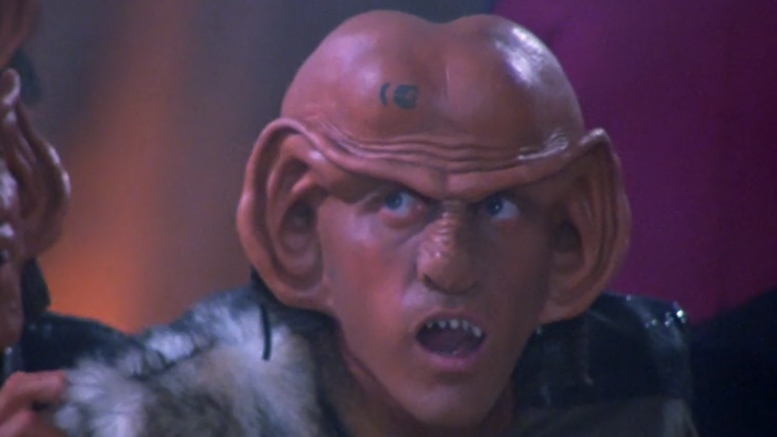 Of course Max Grodénchik, who played Rom in DS9, also appeared as the Ferengi Sovak in Next Gen’s CAPTAINS HOLIDAY. I have to say, that was a winning performance and set the tone for a harder edge Ferengi. Of course Armin Shimerman was the first to call us Hu-marn’s which set the tone of it’s pronunciation that know one else ever seemed to get quite right. It was the writers that stunk up the place. Not the actors, for sure. The weird hand gestures and monkey-like moves were the actor’s idea I’m sure. They failed that first attempt (Then again the whole first season of TNG did! ), but Shimerman more than redeemed himself with the memorable performance of Quark in my opinion. In an earlier comment someone suggested that it was the episode’s director who thought of the Ferengi as monkey-like and made the actors move like that. Oh c’mon, yes, half of the first season was subpar or even crap, but it also had great episodes such as Datalore, Angel One, etc. ANGEL ONE has the worst of Riker’s ‘acting with hands’ high-schoolishness near the end, I remember that even now, though I haven’t tried watching it since 2nd airing. Thankfully DS9 did such a good job of rebuilding what we know of Ferengi that I can just think of those early encounters as morons (apparently every species has them) which somehow managed to get hold of a ship. This exactly! With 20/20 vision and a bit of optimism, one can view these differences in portrayals as akin to real world variations between individuals. Oddly enough, CAPTAIN’S HOLIDAY is the only other TNG I’ve watched this year, so I have gotten my fill and then some of TNG ferengi at this point. All I remember from way back when was after the “ominous” name drop we were kinda expecting something more menacing. As presented, the Ferengi came across as more annoying than anything else. I think it might have gone over better had the expectations not been ramped up by the writers. I did like the alien movements. But that is something not really expected in what was made up to be the series’ main antagonists. And I really found the worship of profit in their society to be, well…. Dumb. Hence making such a race the main “bad guys” if you will, was a poor choice. Right, I think “annoying” describes it best. They didn’t really look or feel like a threat, except that Picard and crew first suspected that they drained the big E of all it’s power. And ok, they had those weapons, but that was about it. You could easily punch them, were mentally superior, etc. Later episodes redeemed them a bit, but it really wasn’t until DS9, I guess, that they were fully established. The first mention of them in the pilot seemed to hold great promise – that they ate their enemies and were a mysterious menace of untold power; kind of like the White Walkers in the opening scenes of Game of Thrones. Then they appeared in the flesh shortly after, and that was the end of that. The really obnoxious thing for me was that for a race obsessed work profits, that didn’t understand what that actually meant or how to achieve that. Stealing isn’t a profit. Gain, yes, but not profit. Defrauding someone is only profitable once. I was told once that a typical business earns 90% of their profits from 10% of their customers, and that it costs 3 times more to attract a new customer than to keep a customer. Customer retention is the keep to a profitable business. Overall, the Ferengi were really bad at business. So basically Ira Steven Behr has confirmed what I had always suspected, that Two and a Half Men was based on Quark, Rom and Nog. Behr- an insightful glimpse into how a real writer thinks, as opposed to the basic hacks running Star Trek Disco. Was this a deliberate decision? As in ” we know already that these actors are comfortable with the makeup, and if anyone knows how to play a Feregingi/Cardassian, it’s them”?? I’m going to guess that it was likely more an economic decision based on the fact that they had already made molds and appliances based on said molds, for those actors, i.e. they were already on hand ready to fit? Thus saving the production the cost of making new molds, etc. for new actors that could have alternatively been cast? The Ferengi wound up being wonderfully developed on DS9, one of the best character elements of that show. And I’m glad that Armin Shimerman was so strongly motivated to do the outstanding job that he did. But, with respect to the initial failure of the Ferengi on TNG, the fault did not lie with Shimerman at all. The fault lies with (1) the character concept and design——the Ferengi are funny looking, plain and simple. If you want menacing characters, you probably shouldn’t make them short with big ears; and, (2) if you do decide to make them look that way, then you shouldn’t write their personalities as devious and slippery. The Ferengi as originally conceived has “comedy” written all over it.